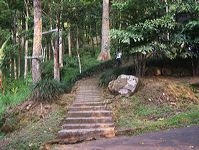 Reco Lanang is the relic of Mojopahit Kingdom, at the area of Budha religion. It is the description of Dhani Budha (Dhani Bodhisatwa) which is called 'Aksobnya'. Aksobnya controled the direction of East point of the compass. Aksobnya was always contemplantive and stayed at the sky. By this power, he spouted a Budha who teach good deeds in the world. 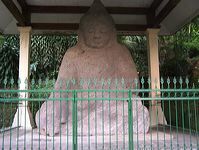 This Budha statue is the reflection of Mojokerto life in the past. 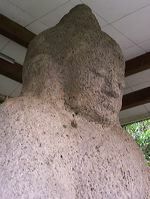 It is the proof that in Mojokerto area, Budha religion was get develope. 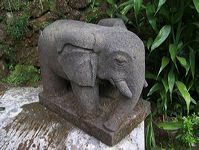 This statue also become one of old statue in Mojokerto regency beside old statues in Trowulan area. The statue formed a Budha statue that sit with crossed legs and use yellow cloth.